Welcome to another edition of Constellation Friday! Today, in honor of the late and great Tammy Plotner, we take a look at the “little horse” – the Equuleus constellation. Enjoy! In the 2nd century CE, Greek-Egyptian astronomer Claudius Ptolemaeus (aka. Ptolemy) compiled a list of the then-known 48 constellations. This treatise, known as the Almagest, would be used by medieval European and Islamic scholars for over a thousand years to come, effectively becoming astrological and astronomical canon until the early Modern Age. Welcome back to Messier Monday! Today, we continue in our tribute to our dear friend, Tammy Plotner, by looking at the globular cluster known as Messier 62. One of these objects is the globular cluster known as Messier 62, which spans about 100 light-years in diameter and is approximately 22,200 light years from Earth. Located in the southern constellation of Ophiuchus, this cluster is easy to find because of its proximity to Antares – the brightest star in Scorpius constellation – and is easily viewed suing binoculars and small telescopes. Positioned about 22,500 light years away from Earth, this glorious gravitationally bound ball of stars could span as much as 100 light years of space. Captured within its confines are 89 known variable stars – most of them RR Lyrae types. M62 has a very dense core… One which may have experienced core collapse during its long history. An ordinary globular cluster? Not hardly. It’s one that holds some optical surprises. While Charles Messier first discovered this globular cluster on June 7, 1771 – he didn’t accurately record its position until June 4, 1779. M62 is easily located about 5 degrees (3 finger widths) southeast of Antares – but because it is small, it can easily be overlooked in binoculars. Take your time, because it is only just a little more than an average binocular field away from an easy marker star and bright enough to be seen even with smaller instruments under not so good skies. In the finderscope of a telescope, begin with Antares in the center and shift southwest. At 5X magnification, it will show as a faint haze. In a small telescope, you may get some resolution – but expect this globular cluster to appear more comet-like. Larger telescopes can expect a wonderful explosion of stars! Welcome back to Messier Monday! In our ongoing tribute to the great Tammy Plotner, we take a look at that swirling, starry customer, the Whirlpool Galaxy! One of these is the spiral galaxy located in the constellation Canes Venatici known as the Whirlpool Galaxy (aka. Messier 51). Located between 19 and 27 million light-years from the Milky Way, this deep sky object was the very first to be classified as a spiral galaxy. It is also one of the best known galaxies among amateur astronomers, and is easily observable using binoculars and small telescopes. “We have then an object presenting an amazing display of the uncontrollable energies of the Omnipotence, the contemplation of which compels reason and admiration to yield to awe. On the outermost verge of telescopic reach we perceive a stellar universe similar to that to which we belong, whose vast amplitudes no doubt are peopled with countless numbers of percipient beings; for those beautiful orbs cannot be considered as mere masses of inert matter. And it is interesting to know that, if there be intelligent existence, an astronomer gazing at our distant universe, will see it, with a good telescope, precisely under the lateral aspect which theirs presents to us. But after all what do we see? Both that wonderful universe, our own, and all which optical assistance has revealed to us, may be only the outliers of a cluster immensely more numerous. Lord Rosse would continue on in 1844 with his 6-feet (72-inch) aperture, 53-ft FL “Leviathan” telescope, but he was a man of fewer words. May the stars from this distant island universe fill your eyes! Locating M51 isn’t too hard if you have dark skies, but this particular galaxy is very difficult where light pollution of moonlight is present. To find it, start with Eta UM, the star at the handle of the Big Dipper. In the finderscope or binoculars, you’ll clearly see 24 UM to the southwest. Now, center your optics there and move slowly southwest towards Cor Caroli (Alpha CVn) and you’ll find it! In locations where skies are clear and dark, it is easy to see spiral structure in even small telescopes, or to make out the galaxy in binoculars – but even a change in sky conditions can hide it from a good location. Rich field telescopes with fast focal lengths to an outstanding job on this galaxy and companion and you may be able to make out the nucleus of both galaxies on a good night from even a bad location. Welcome back to Messier Monday! In our ongoing tribute to the great Tammy Plotner, we take a look at Orion’s Nebula’s “little brother”, the De Marian’s Nebula! One of these objects is the elliptical galaxy known as Messier 49 (aka. NGC 4472). Located in the southern skies in the constellation of Virgo, this galaxy is one several members of the Virgo Cluster of galaxies and is located 55.9 million light years from Earth. On a clear night, and allowing for good light conditions, it can be seen with binoculars or a small telescope, and will appear as a hazy patch in the sky. But the very best was yet to come… the discovery of a black hole! According to NASA, the results from NASA’s Chandra X-ray Observatory, combined with new theoretical calculations, provide one of the best pieces of evidence yet that many supermassive black holes are spinning extremely rapidly. The images on the left show 4 out of the 9 large galaxies included in the Chandra study, each containing a supermassive black hole in its center. The Chandra images show pairs of huge bubbles, or cavities, in the hot gaseous atmospheres of the galaxies, created in each case by jets produced by a central supermassive black hole. Studying these cavities allows the power output of the jets to be calculated. This sets constraints on the spin of the black holes when combined with theoretical models. The Chandra images were also used to estimate how much fuel is available for each supermassive black hole, using a simple model for the way matter falls towards such an object. The artist’s impression on the right side of the main graphic shows gas within a “sphere of influence” falling straight inwards towards a black hole before joining a rapidly spinning disk of matter near the center. Most of the material in this disk is swallowed by the black hole, but some of it is swept outwards in jets (colored blue) by quickly spinning magnetic fields close to the black hole. Previous work with these Chandra data showed that the higher the rate at which matter falls towards these supermassive black holes, the higher their power output is in jets. However, without detailed theory the implications of this result for black hole behavior were unclear. The new study uses these Chandra results combined with leading theoretical models for the production of jets, plus general relativity, to show that the supermassive black holes in these galaxies must be spinning at close to the maximum rate. If black holes are spinning at this limit, material can be dragged around them at close to the speed of light, the speed limit from Einstein’s theory of relativity. “A bright, round, and well-defined nebula, on the Virgin’s left shoulder; exactly on the line between Delta Virginis and Beta Leonis, 8deg, or less than half-way, from the former star. With an eyepiece magnifying 93 times, there are only two telescopic stars in the field, one of which is in the sp and the other in the sf quadrant; and the nebula has a very pearly aspect. This object was discovered by Oriani in 1771 [this is wrong: it was Messier who discovered it that year; Oriani found it only in 1779], and registered by Messier as a “faint nebula, not seen without difficulty,” with a telescope of 3 1/2 feet in length. It is a pity that this active and very assiduous astronomer could not have been furnished with one of the giant telescopes of the present days. Had he possessed efficient means, there can be no doubt of the augmentation of his useful and, in its day, unique Catalogue: a collection of objects for which sidereal astronomy must ever remain indebted to him.” This error was repeated by John Herschel in his General Catalogue of 1864 (GC), who also erroneously assigned this object to “1771 Oriani,” and also found its way into J.L.E. Dreyer’s NGC. Let’s hope you don’t mistake it with the many other galaxies nearby! Galaxy hopping isn’t an easy chore and it takes some practice. Starting looking for M49 about halfway between Epsilon and Beta Virginis. Use Gamma to help triangulate your position. At near magnitude 8, Messier 49 is quite binocular possible and would show under dark sky conditions as a faint, very small egg shaped fog. However, it will not show in a finderscope of a telescope – but the nearby stars will. Use their patterns to help guide you there. Because galaxies require dark skies, M49 cannot be found under urban conditions or during moonlit nights. In telescopes as small as 70mm, it will appear as a nebulous egg shape and become brighter – but no more resolved to larger instruments. To assist in location, begin with lowest magnification and increase magnification once found to darken background field. And here are the quick facts to help you get started! Welcome back to Messier Monday! In our ongoing tribute to the great Tammy Plotner, we take a look at the double star known as Messier 41. Enjoy! One of these objects is the open star cluster known as Messier 41 (aka. M41, NGC 2287). Located in the Canis Major constellation – approximately 4,300 light years from Earth – this cluster lies just four degrees south of Sirius, the brightest star in the night sky. Like most open clusters, it is relatively young – 190 million years old – and contains over 100 stars in a region measuring 25 to 26 light years in diameter. Running away from us at a speed of about 34 kilometers per second, this field of about 100 stars measures about 25 light years across. Born about 240 million years ago, it resides in space approximately 2300 light years away from our solar system. Larger aperture telescopes will reveal the presence of many red (or orange) giant stars and the hottest star in this group is a spectral type A. That means we’ve only got another 360 million years to observe it before it’s completely gone (though some estimates place it at about 500 million). Either way, this star cluster is destined to disappear, perhaps before we are! Following suit, other historical astronomers also observed M41 – including Sir John Herschel to include it in the NGC catalog. While none found it particularly thrilling… their notes range from a “coarse collection of stars” to “very large, bright, little compressed”, perhaps you will feel much differently about this easy, bright target! Finding Messier 41 isn’t very difficult for binoculars and small telescopes – all you have to know is the brightest star in the northern hemisphere, Sirius, and south! Simply aim your optics at Sirius and move due south approximately four degrees. That’s about one standard field of view for binoculars, about one field of view for the average telescope finderscope and about 6 fields of view for the average wide field, low power eyepiece. Because Messier 41 is a large star cluster, remember to use lowest magnification to get the best effect. Higher magnification can always be used once the star cluster is identified to study individual members. M41 is quite bright and easily resolved and makes a wonderful target for urban skies and moonlit nights! Welcome back to Constellation Friday! Today, in honor of the late and great Tammy Plotner, we will be dealing with Canes Venatici constellation. In the 2nd century CE, Greek-Egyptian astronomer Claudius Ptolemaeus (aka. Ptolemy) compiled a list of the then-known 48 constellations. His treatise, known as the Almagest, would be used by medieval European and Islamic scholars for over a thousand years to come. Today, this list has been expanded to include the 88 constellations recognized by the IAU. One of these is known as Canes Venatici, a small northern constellation that is bordered by Ursa Major to the north and west, Coma Berenices to the south, and Boötes to the east. Canes Venatici belongs to the Ursa Major family of constellations, along with Boötes, Camelopardalis, Coma Berenices, Corona Borealis, Draco, Leo Minor, Lynx, Ursa Major, and Ursa Minor. 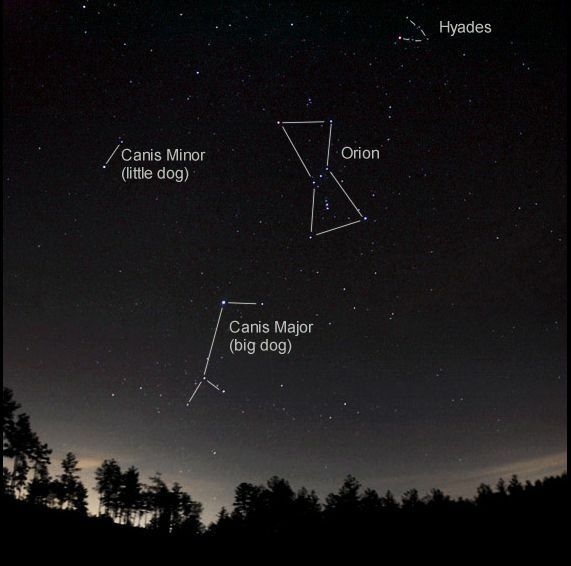 The small northern constellation of Canes Venatici represents the hunting dogs – Chara and Asterion – of Boötes. It is also one of three constellations that represent dogs, along with Canis Major and Canis Minor. Given its comparatively recent origin, there is no real mythology associated with this asterism. However, it does have an interesting history. During Classic Antiquity, the stars of Canes Venatici did not appear very brightly in the night sky. As such, they were listed by Ptolemy as unfigured stars below the constellation Ursa Major in the Almagest, rather than as a distinct constellation. During the Middle Ages, the identification of these stars as being the dogs of Boötes arose due to a mistranslation. Some of the component stars in the nearby constellation of Boötes (which was known as the “herdsman”) were traditionally described as representing his cudgel. When the Almagest was translated from Greek to Arabic, the translator – the Arab astronomer Hunayn ibn Ishaq – did not know the Arabic word for cudgel. As such, he chose the closest translation in Arabic – “al-`asa dhat al-kullab” -which literally means “the spearshaft having a hook” (possibly in reference to a shepherd’s crook). When the Arabic text was later translated into Latin, the translator mistook the Arabic word “kullab” for “kilab” – which means “dogs” – and wrote the name as hastile habens canes (“spearshaft having dogs”). This representation of Boötes having two dogs remained popular and became official when, in 1687, Johannes Hevelius decided to designate them as a separate constellation. The northern of the two hunting dogs was named Asterion (‘little star’) while the southern dog was named Chara – from the Greek word for ‘joy’,. The constellation’s brightest star is Cor Caroli, which is perhaps one of the most splendid of all colorful double stars. The name literally means “Charles’ heart”, and was named by Sir Charles Scarborough in honor of Charles I – who was executed in the aftermath of the English Civil War. The star is also associated with Charles II of England, who was restored to the throne after the interregnum following his father’s death. Cor Caroli is a binary star with a combined apparent magnitude of 2.81 which marks the northern vertex of the Diamond of Virgo asterism. The two stars are 19.6 arc seconds apart and are easily resolved in small telescopes and steady binoculars. The system lies approximately 110 light years from Earth. It’s main star, a² Canum Venaticorum, is the prototype of a class of Spectral Type A0 variable stars (the so-called a² Canum Venaticorum stars). These stars have a strong stellar magnetic field, which is believed to produce starspots of enormous extent. Due to these starspots, the brightness of a² Canum Venaticorum stars varies considerably during their rotation. Their brightness also varies between magnitude +2.84 and +2.98 with a period of 5.47 days. The companion, a¹ Canum Venaticorum (a spectral type F0 star), is considerably fainter at +5.5 magnitude. Next up is Y Canum Venaticorum (Y CVn), which was named “La Superba” by 19th century astronomer Angelo Secchi for its uncommonly beautiful red color. This name was certainly appropriate, since it is one of the reddest stars in the sky, and one the brightest of the giant red “carbon stars”. La Superba is the brightest J-star in the sky, a very rare category of carbon stars that contain large amounts of carbon-13. Its surface temperature is believed to be about 2800 K (~2526 °C; 4580 °F), making it one of the coldest true stars known. Its appearance, temperature and composition are all indications that it is currently in the Red Giant phase of its life-cycle. Y CVn is almost never visible to the naked eye since most of its output is outside the visible spectrum. Yet, when infrared radiation is considered, Y CVn has a luminosity 4400 times that of the Sun, and its radius is approximately 2 AU. If it were placed at the position of our sun, the star’s surface would extend beyond the orbit of Mars. Canes Venatici is also home to several Deep Sky Objects. For starters, there’s the tremendous globular cluster known as Messier 3 (M3). Messier 3 has an apparent magnitude of 6.2, making it visible to the naked eye. It was first resolved into stars by William Herschel around 1784. This cluster is one of the largest and brightest, made up of around 500,000 stars, and is located about 33,900 light-years away from our solar system. Then there’s the Whirlpool Galaxy, also known as Messier 51 or NGC 5194. This interacting, grand-design spiral galaxy is located at a distance of approximately 23 million light-years from Earth. It is one of the most famous spiral galaxies in the night sky, for both its grace and beauty. The galaxy and its companion (NGC 5195) are easily observed by amateur telescopes, and the two galaxies may even be seen with larger binoculars. Canes Venatici is also home of the Sunflower Galaxy (aka. Messier 63 and NGC 5055), an unbarred spiral galaxy consisting of a central galactic disc surrounded by many short spiral arm segments. It is part of the M51 galaxy group, which also includes the Whirlpool Galaxy (M51). In the mid-1800s, Lord Rosse identified the spiral structure within the galaxy, making this one of the first galaxies in which “spiral nebulae” were identified. Now hop over to the barred spiral galaxy known as Messier 94 for some comparison. It was discovered by Pierre Méchain in 1781 and catalogued by Charles Messier two days later. Although some references describe M94 as a barred spiral galaxy, the “bar” structure appears to be more oval-shaped. The galaxy is also notable in that it has two ring structures, an inner ring with a diameter of 70″ and an outer ring with a diameter of 600″. These rings appear to form at resonance locations within the disk of the galaxy. The inner ring is the site of strong star formation activity and is sometimes referred to as a starburst ring. This star formation is fueled by gas that is dynamically driven into the ring by the inner oval-shaped bar-like structure. For a completely different galaxy, try Messier 106 (NGC 4258). This spiral galaxy is about 22 to 25 million light-years away from Earth. It is also a Seyfert II galaxy, which means that due to x-rays and unusual emission lines detected, it is suspected that part of the galaxy is falling into a supermassive black hole in the center. Nearby NGC 4217 is a possible companion galaxy. The constellation does not have any stars with known planets, and there is one meteor shower associated with the constellation – the Canes Venaticids. While it basically consists of only two bright stars, the Canes Venatici constellation is still fairly easy to locate and is bordered by Ursa Major, Boötes and Coma Berenices. It can be spotted with the naked eye on a clear night where light conditions are favorable. However, for those using binoculars, finderscopes and small telescopes, the constellation has much to offer the amateur astronomer and stargazer. It’s brightest star, Cor Calroli can be found at RA 12h 56m 01.6674s Dec +38° 19′ 06.167″, while beautiful Y Canum Venaticorum (aka. “La Superba”) can be seen at RA 12f 45m 07s Dec +45° 26′ 24″. And M51 is easy to find by following the easternmost star of the Big Dipper, Eta Ursae Majoris, and going 3.5° southeast. Its declination is +47°, so it is circumpolar for observers located above 43°N latitude. Welcome back to Messier Monday! In our ongoing tribute to the great Tammy Plotner, we take a look at the Messier 23 open star cluster. Enjoy! One of these objects is Messier 23 (aka. NGC 6494), a large open star cluster that is located in the constellation Sagittarius. Given its luminosity, it can be found quite easily in the rich star fields of the summer Milky Way using small telescopes and even binoculars. Located some 2,150 light years (659 Parsecs) away from Earth, this vast cloud of 176 confirmed stars stretches across 15 to 20 light years of space. At an estimated 220 to 300 million years old, Messier 23 is on the “senior citizen” list of galactic open clusters in our galaxy. At this age, its hottest stars reach spectral type B9, and it even contains a few blue straggler candidates. Remember when observing Messier 23 that it won’t slap you in the face like many objects. Basically, it looks like a stellar scattering of freckles across the face of the sky when fully-resolved. It’s actually one of those objects that’s better to view with binoculars and low power telescopes. M23 can be easily found with binoculars about a finger’s width north and two finger widths west of Mu Sagittarii. Or, simply draw a mental line between the top star in the teapot lid (Lambda) and Xi Serpentis. You’ll find a slight compression in the star field about halfway between these two stars that shows up as an open cluster with binoculars. Using a finderscope, the object will appear nicely as a hazy spot. And for those using telescopes of any size, you’ll need to use fairly low magnification to help set this cluster apart from the surrounding star field, and it will resolve well to almost all instruments.